We have numerous sayings in our cultures about how powerful visualizations are. One that the challenges with knowledge work is that for the most part, most of our work is invisible until it’s done. Only Neo can see bits and bytes which leaves the rest of us a little in the dark. If you’re building a building, or digging a hole in the ground, progress is obvious! For invisible work, progress is very difficult to monitor. So we track work in some software system, but then we hide all of our knowledge in text and numbers! Our love of spreadsheets is epic in proportion. Status reports! MS Project files! All of this data!! For all intents and purposes, our work is still invisible! We often mistake this data for knowledge and understanding and the true insights are left hidden in the numbers. On our project, we knew it would be very important to understand at a glance where we were in our workflow. We were doing something very novel for this organization and in order to mitigate the risk of heading too far in the wrong direction (which could be any direction at this point), we needed knowledge. We needed to quickly identify roadblocks to progress, which often included self-inflicted delays. We needed to engage with our sponsor in a meaningful manner. So we started drawing pictures! The most important “picture” that we have used has been our storyboard. This board is very important to us. It is a muster point for our daily stand-up meetings. It is a place on which to hang “adornments” that help us quickly assess our current state. It is a tool that promotes conversations. And it is always there, silently reminding us to be disciplined with efforts to visualize our work. Our storyboard looks like pretty much like any other Agile teams storyboard in form, but this one is a unique work of art. Well, unique in that it is exactly what we need it to be at the moment. It represents our workflow. We have our WIP limits on it. And because we are fairly disciplined in maintaining the current state of all our work, it’s always up to date. 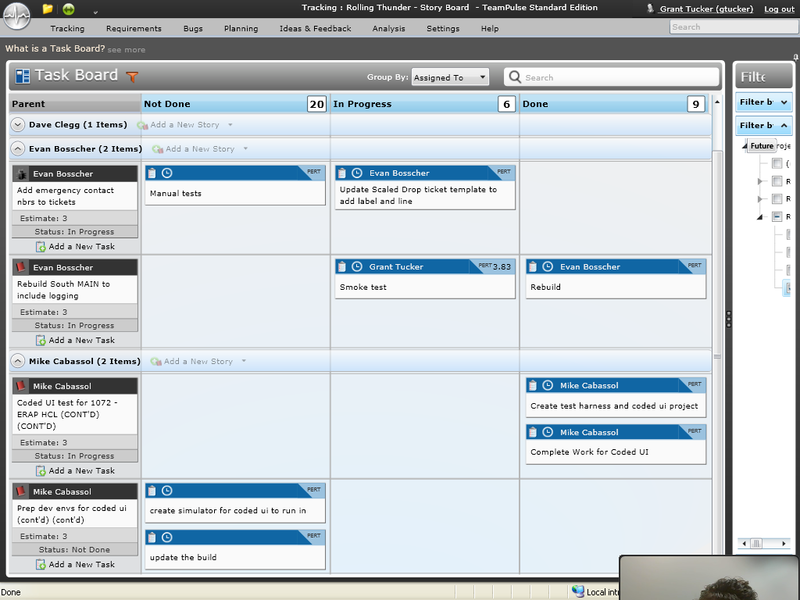 We also visualize our tasks and review these daily as well. 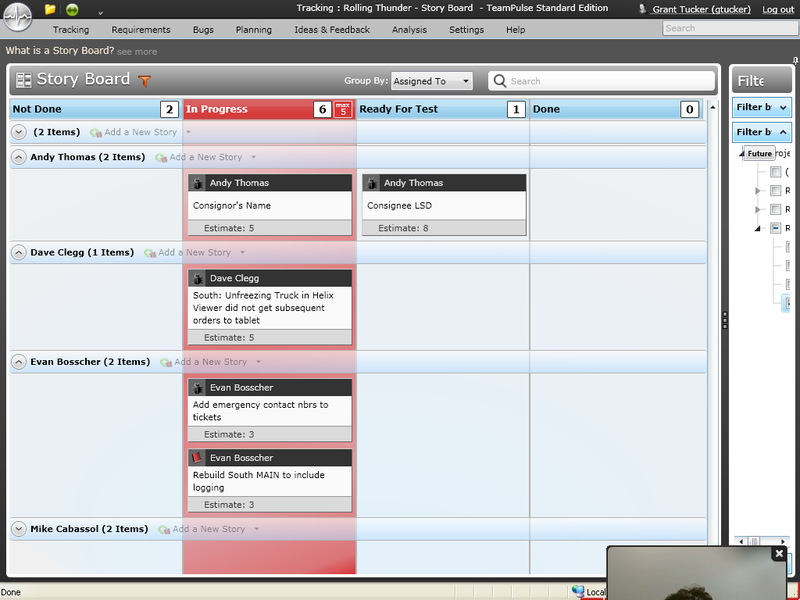 TeamPulse has a story board as well as a task board for more granular visualizations. 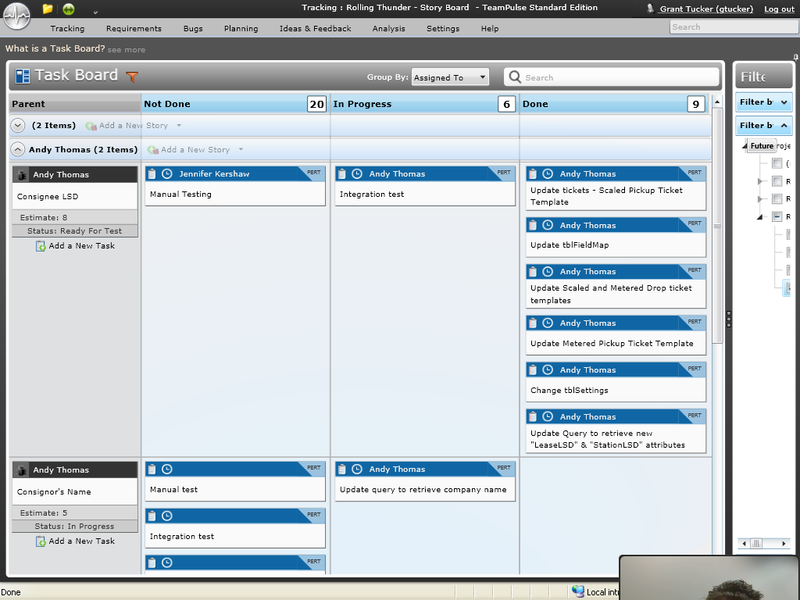 We don’t have WIP limits enabled on the tasks boards, but again, the intent is to see work flowing through the system. And with an explicit policy that tasks should have a cycle time of 1 day, any time an item is discussed at 2 stand-up meetings, the team knows that the work isn’t progressing as expected and some sort of investigation and corrective action may need to take place. 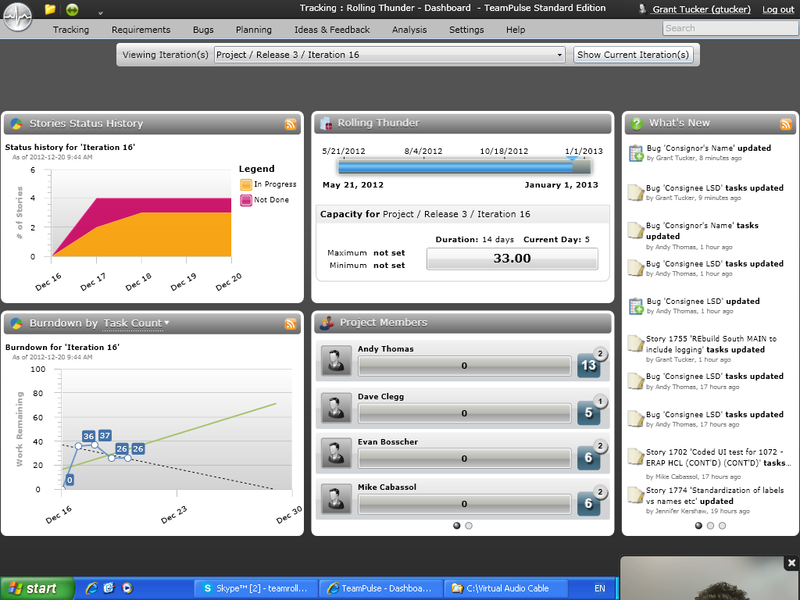 Finally, we use TeamPulse dashboards to visualize our progress over the course of an iteration. Everyday, we review the storyboards and the tasks boards during our stand-up, and then we review the dashboards to bring the entire conversation back to our progress versus our (the team’s) expectations for the iteration. These dashboards provide that high-level perspective that ties everything back together. And all of this information is available on the web, to everyone on the project team, including the sponsor. There is no need to interpret numbers. There isn’t a report that needs to be compiled. And the information we want to present is immediately available in a very easy to consume and impactful format because a picture is worth a thousand words! Going back to the first ALM Adoption Success Factor of Transparency, having something to be transparent with has been a key enabler of success for our team as we strive to deliver this project and continuously improve and get better as we do it. By Agile Ramblings in Adoption, Agile, Kanban, Lean on December 31, 2012 .